On August 29 from midnorthern latitudes, Venus will be visible low above the western horizon after sunset. If you're lucky you might catch Mars and Mercury too. If you can't find it, keep looking during the coming weeks; Venus will set later after sunset every night, eventually becoming an unmissable "evening star." 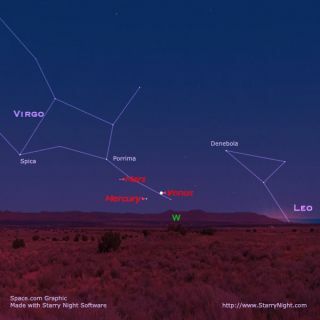 Currently, the planet Venus is visible, albeit very low inthe western evening sky right after sundown. Those with obstructions such astrees or buildings toward the west may not be able to see Venus yet, thanks toits low altitude. But this current evening apparition of Venus is going toevolve into a very good one in the coming days and weeks, so let's get into afuller explanation of what is to come. Venus passedsuperior conjunction (appearing to go behind the sun as seen from Earth) backon June 9. Initially, it was mired deep in the brilliant glare of the sun.Nonetheless, in the days that followed it moved on a steady course toward theeast and pulled ever-so-slowly away from the sun's vicinity. And now, during the last days of August and intoearly September, Venus has finally begun climbing up out of the sunset glow inearnest and is now about to reclaim its role as the brilliant "eveningstar," a title it has not held since the end of July 2007. Look for it nowwith binoculars shortly after sundown very low in the southwest. Venus willstand about 10 degrees high in the western sky at sundown (your clinched fistheld at arm's length is roughly 10 degrees wide) and will touch the horizonjust a few minutes shy of a full hour after sunset, giving less experienced skywatchers a chance to get a good glimpse. In the following weeks, it should gradually become easier tosee. By October 1, it will set about 30 degrees south of due west nearly 75minutes after sunset. Continuing to swing east of the sun as the fall seasonprogresses, Venus will become plainly visible in the southwestern evening skyeven to the most casual of observers. On the evening of December 1, Venus willteam up with the planet Jupiter anda lovely crescent moon in the southwest sky right after sundown: the threebrightest objects in the night sky gathering in a dramatic celestial tableau thatwill turn heads even of those who normally do not look up at the sky at night. Appearing as a brilliant silvery-white starlike object ofmagnitude ?4.3, our sister planet will set almost four hours after the sun byChristmas Day. In fact, if the air is very clear and the sky a good, deep blue,you might try looking for Venus shortly before sunset. As the sky darkens, itwill seem to swell from a tiny white spark to a big, almost dazzlingChristmas-season star. Indeed, it will be during the winter of 2009 that Venus willperform like a sequined showgirl, calling attention to herself each evening. Viewed in the western twilight, this planet always appearsdazzlingly bright to the unaided eye, and more so in binoculars. Venus reachesits greatest elongation — its greatest angular distance — 47 degrees to theeast of the sun on January 14. It will appear at its brightest in midwinter asit heads back down toward the sun, reaching its greatest brilliancy for thisapparition on February 19 at magnitude ?4.6. The planet will be most strikingthen, shining nearly twice as bright as it does now. Venus will then slide backtoward the glare of the sun, but because it will appear to pass more than eightdegrees north of it when it passes inferior conjunction on March 27, a mostunusual circumstance will take place for a few days around that time: Venuswill be visible as both an evening and morning object, glowing low in the westright after sunset and also low in the east just before sunrise. It finally(almost reluctantly) will vanish for evening viewers view by the end of March. Between now and the end of March, repeated observation of Venuswith a small telescope will show nearly a complete range of its phases and disksizes. Currently, the planet appears almost full (92 percent sunlit on August29), and through the first half of the upcoming fall season will displaynothing more than a tiny, dazzling gibbous disk. It will start becomingnoticeably less gibbous by early December. In mid January 2009, Venus reachesdichotomy (displaying a "half moon" shape). Then, during February, itshows us an increasingly large crescent phase as it swings toward Earth.Indeed, those using telescopes will note that while the Earth-Venus distance islessening, the apparent size of Venus' disk will grow, doubling from itspresent size by January 3. When it has doubled again in size on February 26,its large crescent shape should be easily discernable even in steadily held7-power binoculars. But even after it passes inferior conjunction on March 27,our Venus show will not be over, for it dramatically reemerges as a dazzling"morning star" low in the eastern sky by the beginning of April.Then, a repeat performance will begin, with the above sequence of eventsreversed. And that will continue right through to the end of 2009.